Go count the items in your wardrobe and check the total off against the number you actually wear. Chances are it’s scarily low. The reality is that the pieces that stand us the best are those that outlast time and transcend trend and ultimately they’re the most wearable (read that as boring and you’ve missed the mark). These are the pieces that make us feel good. Valentino designers Maria Grazia Chiuri and Pierpaolo Piccioli kindly reminded us of this yesterday. 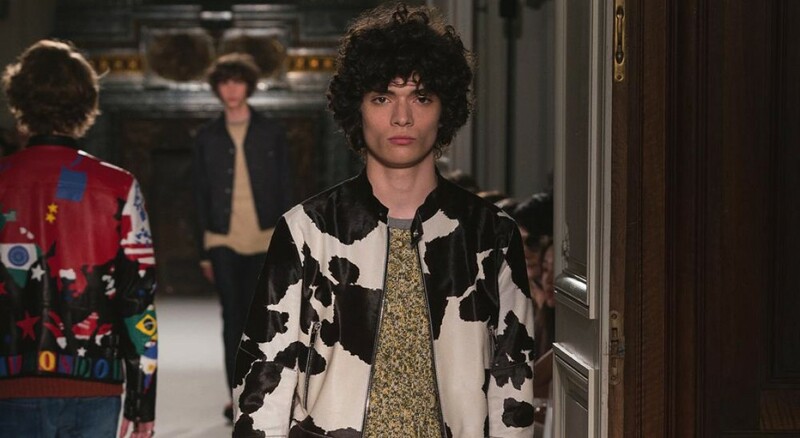 Showing SS16 in the Hotel Salamon de Rothschild, the duo kicked off this season of Paris menswear with a resounding boom. No show pony antics, just a banging collection of pieces that will sell. References were flung far and wide. Unlike last season’s direct cubist link there wasn’t one point of influence that stuck out, instead a myriad relatable and fun ideas that worked together as a seamless, multi textured journey. 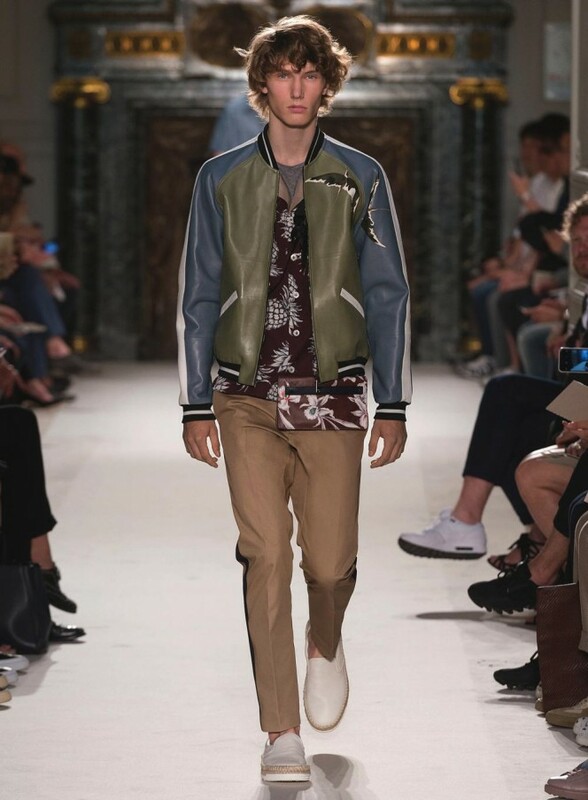 Hawaiian shirting, guitar bag straps, silk bomber jackets, Native American woven bracelet embellishments on coat sleeves and shoulders. A killer biker patched with a US flag and all the states, puzzled together in multicolour (we’ve got dibs). Denim was everywhere and it was good. Craftsmanship key as ever, jeans and top layers were stitched and thermal-bonded. Look 65, a deliciously DYI patched-up jacket; Look 66 with its patchworked camo in periwinkle and indigo blue. Punk! DIY! Military! Yes, there was a lot here but together it worked. That’s thanks to a golden ability that thankfully these two possess: to work the buzz-worthy in with the downright commercial and keep it at a level that is at once on the pulse and beyond it. We said these pieces will sell, what we mean is they’ll sell out. Mark up your list ‘cos it’s time to invest.